This lightweight palette features 20 individual mixing wells that correspond to the primary, secondary and tertiary colors in the color wheel. This is a great palette for art educators or beginners and measures 13”x13”. This palette was specially-designed for use with Speedball’s Super Pigmented Acrylic Inks, featuring built-in dip pen and brush rests. 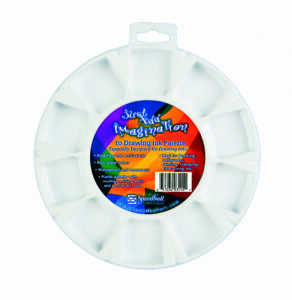 The Just Add Imagination Palette is 8”x8” in size. 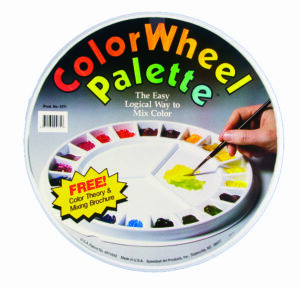 Measuring 16.5”x12” and consisting of 16 individual wells that allow colors to be pulled from the central mixing area, this lightweight palette is excellent for classrooms and studios alike. 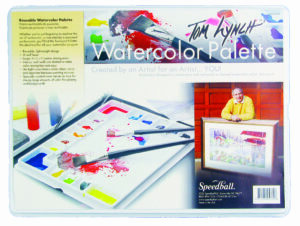 The Tom Lynch Watercolor Palette also includes an airtight cover that is designed to keep paints moist and separated between painting sessions. Featuring 2 large mixing areas and 24 deep wells, the Robert E. Wood palette is excellent for studio work. This palette also includes an airtight cover to leave paints undisturbed and moist between uses. 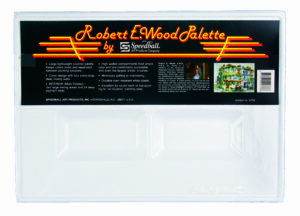 The Robert E. Wood Palette is 16.5”x11” in size. Available in a pure white, plastic finish, this palette features the classic thumb-hole and rounded corners and measure 10”x14”. 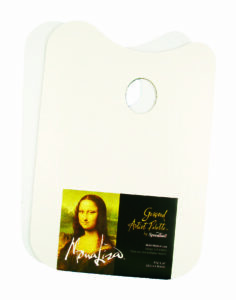 Mona Lisa Gessoed Artist Palettes are designed with a slight tooth finish to accommodate most types of paints. Featuring a rectangular shape with rounded corners and the classic thumb hole, this artist palette is great for mixing and experimentation. 9.9”x14”. This ready-to-use, multi-purpose surface is ultra-smooth and acid-free. Ideal for use with a wide variety of techniques including: texture and rub out painting; drawing with pen & ink, chalk or pastels; painting with acrylics, oils, watercolors, gouache or egg tempura. Available in 12 sizes across 2 styles!